The 2010-2011 AMSOIL Championship Snocross Series kicked off with the AMSOIL Duluth National in Duluth, Minn. on Thanksgiving weekend, where Team AMSOIL/Judnick Motorsports racer Ross Martin picked up a pair of second-place podium finishes. 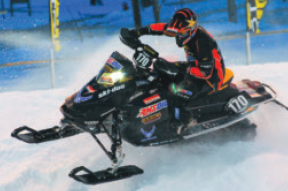 Martin started the 2010-2011 AMSOIL Championship Snocross Series with two second-place podiums. Battling with TJ Gulla for the first half of the Pro Super Stock final, Martin took over the lead at the race’s mid-point, but then dealt with lapped traffic and a hard-charging Tucker Hibbert for the final five laps. Hibbert took the win, with Martin right behind for second. In the AMSOIL Pro Open final, Martin took the lead and looked unstoppable, but once again lap-traffic and Hibbert were too much. Hibbert snagged the lead with less than two laps remaining, and Martin didn’t have enough time to reel him back in, taking the second-place podium. Team AMSOIL/Scheuring Speed Sports rider Darrin Mees took a pair of podiums, finishing second on Saturday and third on Sunday in the Semi-Pro Super Stock division, while Team AMSOIL/Judnick Motorsports racer Mike Bauer finished third on Saturday and fifth on Sunday. Team AMSOIL/Scheuring Speed Sports semi-pro rider Darrin Mees has collected three podiums in four races this season. 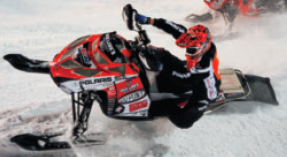 The second round of AMSOIL Championship Snocross Series racing action took place in Fargo, N.D. December 10-11. With temperatures dipping below zero and a heavy snow starting to fall, Team AMSOIL/Scheuring Speed Sports racer Robbie Malinoski took the number-one qualifying position in the AMSOIL Pro Open class. While Malinoski just missed taking the last podium spot in the final, finishing fourth, Martin led most of the race before Hibbert came from behind to take his third win of the year. Martin finished second and holds second in the overall points standings; Malinoski holds ninth. In the Pro Super Stock class, Martin again jumped out to a solid lead, only to finish second to Hibbert in the end. Malinoski was in position to take third, but an aggressive move by Tim Trembley caused an accident that knocked Malinoski out of the race. Martin holds second in the overall points standings and Malinoski holds 10th. In Semi-Pro action, Bauer finished third on Friday, while Mees took third on Saturday. Mees holds third in the overall points standings, while Bauer holds fifth. The AMSOIL Championship Snocross Series heads to Sandy, Utah January 8 for the Western Nationals at Rio Tinto Stadium. (see www.amsoil.com for the latest schedule). Western Nationals Sandy, UT January 23 3-p.m.
Eastern Nationals Farmington, NY March 6 3-p.m.
Michigan National Pontiac, MI March 13 3-p.m.
Hayward Nationals Hayward, WI March 20 3-p.m.
Air Force National Elko, MN April 3 3-p.m.
Nielsen Enterprises Grand Finale Lake Geneva, WI April 17 2-p.m.
Catch all the action of the AMSOIL Championship Snocross Series on the Versus Network.